The most famous consumer show in Holland happened last week…. The Libelle Show is the biggest event in The Netherlands for women to get to know the hottest new products available at shopping malls and large cosmetic stores. Although there was lots of rain the number of people attended was almost 10,000 at the first day only! This show lasted no less than 7 days from early morning till evening! So thousands of women have noticed the re-introduction of our products in the Netherlands…. It was great fun watching all women with shopping bags and goody bags passing by the Paul Penders booth… and to fill-up their bags with Paul Penders goodies as well! 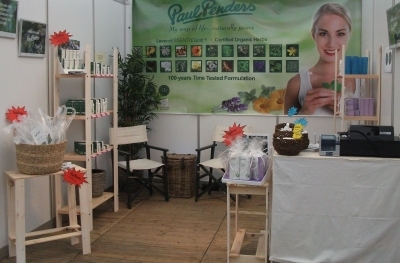 The Libelle Show is famous in Europe to kick off a new brand; selling natural cosmetics with certified organic ingredients and a specific style and essential oil… and that are Paul Penders products of course! Women we talked to where very interested in the story of the herbs, the certification for organic ingredients and the non animal testing. We are very happy to see the interest of high quality. Lots of questions about the organic aspects, and the store locations. Considering that there was quite some competition of local Dutch cosmetic brands, with this in mind, our contacts were excellent. 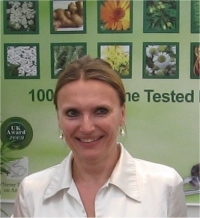 At the show we sold the new Mini Sizes of Aloe & Lavender A.M. Moisturizer and Rosemary & Calendula Cleansing Milk as a special trial promotion pack. One lady even returned buying more products after she tested the Aloe & Lavender A.M. Moisturizer without having an allergic reaction, what she experiences with other brands. She was so happy to find out a new brand that suited her skin so very well. And of course, we were very happy too, to be able to provide her with our Paul Penders solution!! 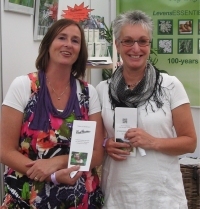 Again, the fair lasted for 7 days with great and spontaneous interactions with the Dutch female consumers. It was a lot of fun, talking to these ladies and selling Paul Penders products!!! … one of the best and most efficient ways to protect your hair in rough weather conditions is to wash your hair with Paul Penders Time-Release Jasmine Shampoo followed by Paul Penders Herbal Lemon Conditioner? The hair should be treated both before and after the exposure to e.g. salt water and heavy sun. 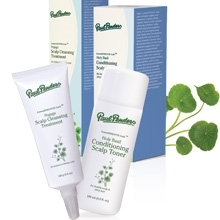 As a follow-up treatment of the hair, Paul Penders Holy Basil Conditioning Scalp Toner should be used for a period of time. If you followed our Iron Man articles, you will know this was how we protected the hair of our sponsored Iron Man. And, it worked to perfection. Time-Release Jasmine Shampoo is a unique approach to washing the hair based on organic olive oil as cleansing agent. The shampoo foams only minimally when applied to the scalp. After some water is added, it “breaks open” and releases gentle foam that cleanses the hair and keeps it shiny. It also ensures a clean, healthy scalp. For those, who like the feel of foam, a second wash can be done, this time with only a minimal amount of shampoo – and the foam will appear. Contrary to mass-produced chemical shampoos, Paul Penders Time-Release Jasmine Shampoos produce only a small amount of foam. It leaves the hair shiny, soft and free of flyaway strands. Herbal Lemon Conditioner is an all-natural conditioner that untangles the hair and leaves it shiny, silky and never weighed down. The lemon essential oil imparts an exquisite fragrance, while added organic apple cider leaves the hair and scalp feeling fresh and clean by eliminating buildup, as well as restoring a proper pH level. Holy Basil Conditioning Scalp Toner is a topical scalp & hair solution that promotes healthy hair growth by improving the condition of the scalp. A combination of herbs and essential oils work to ensure nutrient intake, stimulate circulation and balance sebum production. 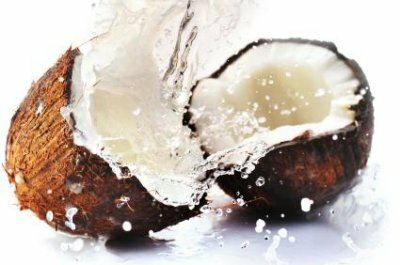 This results in optimal scalp and hair health. It restores luster and gives shine to dull or damaged hair. 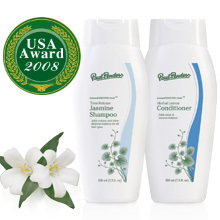 Anti-bacterial plant extracts help calm scalp irritation and prevents dandruff. Holy Basil Conditioning Scalp Toner should be used because beautiful hair starts with a healthy scalp. Are you looking for a refreshing daycare for your skin this summer? Based on only natural ingredients? Why don’t you try the Aloe &Lavender A.M. Moisturizer form Paul Penders Cosmetics? Paul Penders Aloe &Lavender A.M. Moisturizer is refreshing like a light summers breath, feels airy not greasy and contains for example Aloe Vera, Calendula and Vitamin E for natural sun protection. The moisturizer has a slightly herbal scent as if you were walking on the Lavender fields in the Provence of France, but also has a very moisturizing effect and therefore prevents dehydration. Aloe &Lavender A.M. Moisturizer is based on coconut water and thus feels very soft and fresh on your skin. Furthermore; it makes your face glance, lithe and resilient. It’s made of organic cultivated herbs and keeps your skin tenable against external influences. It’s especially suitable for dry and sensitive skin. 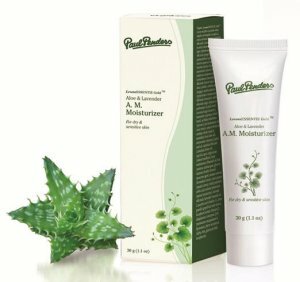 Paul Penders Aloe &Lavender A.M. Moisturizer is available at 30 ml tube packaging: not only for a hygienic point of view, but also very useful to carry with you in your bag. 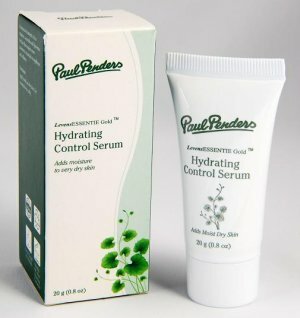 After we have tested this product, we say… please.. DO try Paul Penders Hydrating Control Serum (HCS) at home, will you? Because it is a real savior when your face is in trouble! The tube contains a creamy serum with a surprising effect! Your skin will feel soft and smooth, and it seems like your face is being ‘tight up’ a little. You’re now ready to face the outside world all bright and shiny! Hydrating Control Serum provides your skin with her need for hydration and attends her natural resilience, softness and radiant complexion. The purely natural ingredients of this serum richly provide your skin with the right vitamins, ceramides, liposomes and powerful anti-oxidants to prevent the early signs of aging and simultaneously encourage the production of healthy chloroplasts. 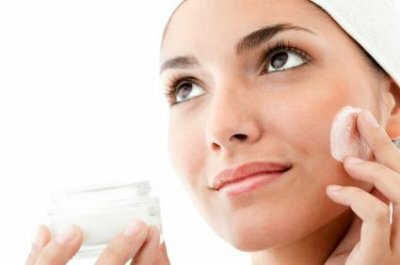 Hydrating Control Serum is preferably used underneath your day moisturizer as it increases the activity of the moisturizer in that way. 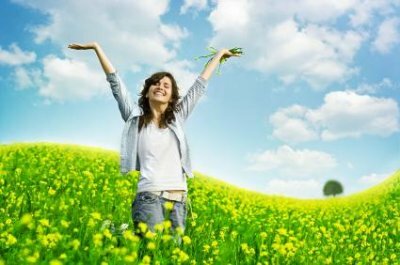 The special LevensESSENTIE Gold® certified organic herbs, as well as plants extracts are for women who believe that nature provides the best ingredients to keep their skin healthy. But also to people who believe that their choice for honest natural products give a fair chance to nature, because these specific choices defines the future of our earth’s children as well. 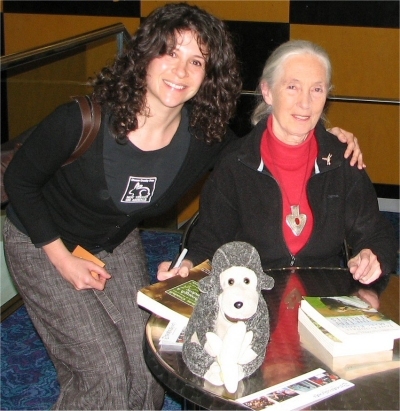 One of the very proud moments in my life with the incredible Jane Goodall during the launch of her film at IMAX…. 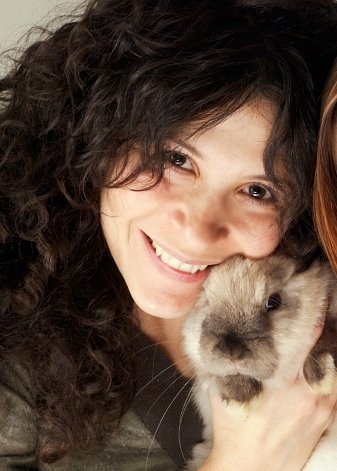 A brief background on myself… Hi : -) I am Nicole Groch. I have been a professional freelance hair & makeup artist based in Melbourne, Australia for over 19 years. I have been working in the fashion, advertising and music industry both in Australia and overseas. Quite some year’s back now, I took it upon myself to rethink my attitude towards the makeup & hair products I used in my kit. I had been a vegetarian for many years for ethical reasons, and only used ‘cruelty free’ products in my work, but I was also very interested in all the natural and organic products that were becoming more readily available. I did research into the common ingredients used in the majority of cosmetic brands and was astounded at how many toxic ingredients they contained and how they can adversely affect our health. 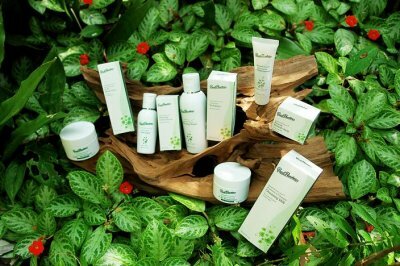 I then converted my kit, so I now use on my clients only the safest, cruelty free and natural products that I can source. This is how I came to love the Paul Penders range as they stood for everything I believed in, vegan, natural and safe. Over the years I got to know Paul and he is an incredible inspirational person. Because I didn’t believe it was ethical to use or promote any products that were tested on animals I was constantly turning down work for companies that either used such products, or had real fur in their ranges, including their TV commercials, fashion parades, fashion shows and product editorials. Particularly I wanted to do something positive with my makeup skills to help animals! So I got in contact with the Australian www.choosecrueltyfree.org.au/makeup.html (they accredit cruelty free companies) and offered to start “The Cruelty Free Makeup Tips”. I arranged a huge celebrity launch for the “I’d Rather Go Naked Than Wear Fur” poster campaign I had put together and did all hair and makeup for it as well. I was able to use my connections to get celebrity support for the front covers of our magazines and for campaigns. After a few years I was asked to become a Director of Choose Cruelty Free and as their PR Director I found Paul Penders products. Our Preferred Product List www.choosecrueltyfree.org.au/list.html lead me to do PR work for other natural and cruelty free companies. The aim of Living Safe is to give individuals easy tools and accurate knowledge to help them create a safe and healthy environment for their children, pets and …ultimately themselves! Since we have launched the site several months ago we have been getting fantastic positive feedback, especially from parents thanking us for creating this much needed site. It has made them more aware and informed about these very important issues. We hope our site will help to create a better world for the all of us. We also have a directory of “Safe & Non-Toxic” companies and of course, Paul’s products are on it as well as they fit the Living Safe ethos perfectly!